Preschool Playbook: Thinking of a Career in Teaching? Sometimes children DO know what they would like to do, but it's not always easy to give them a full idea of what they will be doing. Thanks to a site called citytowninfo.com, perspective teachers can get some insight from seasoned teachers. City Towninfo has put together a free 64 page e-book about being an elementary school teacher. 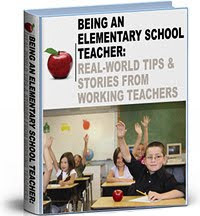 This book contains real life experiences from elementary teachers all over the country. They list their pros of teaching as well as the cons. These teachers are from many different walks of life and I feel that their experiences can be valuable to those thinking about going into teaching. If you are thinking about going into the teaching profession, take a moment to read this book over. Or, if you know of someone that may be thinking about teaching, share this with them as it may help answer some questions they may have. To all getting ready to begin this journey, Good Luck and Have Fun! What a neat resource! I knew the minute I stepped in a classroom (during college) that this is where I was meant to be. It took me a while to learn this though. I originally went to college for broadcasting- glad I changed my major! I think it is so difficult for an 18 year old to make this big decision- luckily they take basic classes first. Thanks for stopping by today. Yeah- my little man is handsome, huh? and so sweet. We are truly enjoying him. It took me almost 40 years to figure out I wanted to be a teacher! I tried all kinds of things from wearing a tie and sitting in a cubicle, to wearing jammies all day working as a freelancer. Sometimes I think it all prepared me to become a teacher. Other times I think it was all just sturm and drang between then and now. It wasn't until I had a child of my own going to school that I realized I'd found my home. I wonder if a book like this would have helped me come to an earlier decision or if I would have still had to try everything else first. Super fun! I love your site!